California parents who severely physically abuse grandchildren in their custody could find the courts assuming jurisdiction over their own children. California law allows courts to exercise jurisdiction over a child who has suffered, or is at substantial risk of suffering, serious physical harm or illness (Section 300 of the Welfare and Institutions Code). If you have child custody concerns, you are advised to contact an experienced family law attorney in San Diego to help you protect your rights. The parents in this case, Darnell H. and R.H., have one child, Marquis, and had three grandchildren, L.M., T.S. and L.S., living with them. The Superior Court of San Diego granted the juvenile court jurisdiction over 10 year-old, Marquis, based on the risk of serious physical harm. At the beginning of this proceeding, the San Diego County Health and Human Services Agency filed a petition on Marquis’s behalf, under section 300 of the Welfare Code. While the petition did not assert direct abuse to Marquis, it did allege that his mother, R.H. subjected her 13 year-old grandchild, L.M., to serious physical abuse. The allegations of abuse included burns with an iron and repeated hitting with items such as an extension cord, a crutch and a fist. Later, the petition was amended to include allegations that both parents abused T.S. Some of the horrid details include putting a lighted cigarette on T.S.’s shin and insisting that T.S. and L.M. sleep on the kitchen floor as a method of punishment. The juvenile court found sufficient evidence to remove all four children from the home. During a contested jurisdiction hearing and disposition, the court heard extensive testimony by a pediatrician who examined and spoke with the children. The physician concluded that L.M. experienced “repeated, severe, longstanding physical abuse.” Throughout the testimony, the grandchildren admitted to extensive and reprehensible abuse, lasting for three years. Marquis denied that any abuse was taking place in the home. Darnell H. and R.H. appealed the order granting jurisdiction over Marquis, arguing that California law limits the court’s jurisdiction to matters involving an abused child or the child’s siblings. The parents tried to argue that because the grandchildren are not Marquis’s siblings, the statute does not apply and may not serve as the basis for jurisdiction. If you are a parent who has questions regarding child custody and visitation matters, you should contact Doppelt and Forney, APLC today. Mr. Doppelt is a hardworking San Diego family lawyer who has over 20 years of experience representing parents in the San Diego area and throughout Southern California. Doppelt and Forney, APLC serves clients in San Diego, La Jolla, Del Mar, Escondido, and more. 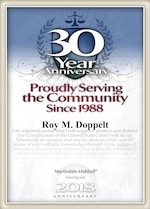 For a free consultation with a knowledgeable family law attorney, contact Doppelt and Forney, APLC through the law firm’s website or give us a call toll-free at (800) ROY IS IT (769-4748).